Phil Hughes has now faced four balls in Test cricket. Hopefully in his next innings he’ll score his first run. We mentioned Phil Hughes a month or so ago when we pondered whether Australia were the worst team in the world or not. He was one of many reasons why we thought they weren’t. Phil Hughes is 20 and so far in his brief cricket career, he’s scored runs for fun. He’s even done it when all the other batsmen in a match have struggled. In fact, he’s done it especially when all the other batsmen playing in a match have struggled. Australia’s batting is still as strong as any other nation’s, if not stronger – it’s their bowling which is currently a bit meh. For Phil Hughes to open for them at 20 is just one of several signs that he could potentially be a very, very serious batsman for quite some time. On the other hand, maybe he’s got a chronic weakness against legside half-volleys. England are sure to fully test this aspect of his game over the summer. I’m sure our bowlers will pepper him with legside half-volleys, but only to set him up for the rank long-hop. Plan A is to pepper him with rank long-hops before surprising him with the legside half-volley. Ideally, it should also be a no-ball, confusing him sufficiently that he might get run out a hundred or so runs later. Ah I see, play the long game. Confuse them with our patience and stubborn resistance to wicket taking. Flawless plan. We can even use the waist-high full toss as a suprise variation. Binged to obesity by Englands all-you-can-eat-buffet-bowling. Cook to be secret bowling weapon? I for one look forward to it. Here’s a youtube clip of what was at the time of this article Phillip Hughes’ entire Test Career. Though he did a bit better in the second innings despite being out several times. 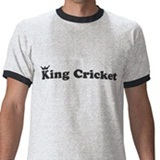 Btw King, any chance you could throw up a link to http://www.statecricket.com/ ?